The arrival of winter means a few different things – a change in weather, a change in wardrobe and of course, a change in our skincare routine. More often than not, you’ll find yourself with dry, flaky (and sometimes itchy) skin. But with a few simple changes to your regular skincare routine and a few new natural skincare products, you’ll be able to combat dry winter skin with ease. Read on to discover how to fight winter dryness with these 10 top tips for both face and body! The problem: When skin becomes extra dry, it can trigger a flare up of keratosis pilaris, a condition that mainly affects the upper arms and causes small bumps and rough skin. Rough, dry skin can also happen on your legs and other parts of your body, especially with the cold weather in winter. The solution: With any dry skin in the winter, especially keratosis pilaris, it’s a good idea to regularly exfoliate with a scrub containing fresh sugar cane crystals to eliminate dead skin cells around your hair follicles and help reduce the appearance of bumps. Pure Fiji’s Coconut Oil Sugar Scrub contains fresh sugar cane crystals designed to manually exfoliate while naturally occurring alpha hydroxyls work to gently buff away aging skin cells, polishing your skin clean and helping to unclog your pores. The deep moisturizing blend of oils nourish, moisturize and protect your beautiful skin, leaving it glowingly healthy. Leave it on for 10 minutes to reap maximum benefits, then rinse thoroughly. Apply a body butter after exfoliating to add even more softness to your skin! Use 2-3 times a week for a healthy, glow. Always make sure you are applying sugar scrub to wet skin. The problem: You’re heading out the door and you realize you forgot to apply your moisturizer – again! The solution: You can’t forget something you can always see so make sure you place your body lotion or butter someplace you’ll always look – on the side of the tub, on the bathroom counter, on your bedside table etc. Don’t tuck it away in a drawer in your bathroom – chances are you’ll forget it’s there! Another great solution is to keep a travel size lotion in your purse for those days when you just keep forgetting. Try Pure Fiji’s Hydrating Body Lotion in travel size. You can easily keep it in your purse, school bag or gym bag so it’s always handy when you need a quick dose of moisture. To make sure you are getting the maximum benefits out of your natural skincare products, try using more than one of your favorite natural skin care products at a time. For example, take a warm bath using either a bath oil or a moisturizing bath soak, which will leave a nice creamy film on your skin. Finish it off with a liberal amount of body lotion to seal in all the benefits of your bath and leave your skin soft and smooth. We recommend Pure Fiji’s Coconut Milk Bath Soak as it contains a bounty of nutrients essential to the support and good health of your skin. Fresh coconut milk with a blend of exotic nut oils rejuvenate, nourish and rehydrate dry skin, leaving it supple, smooth and revitalized. Add 1/4 cup to running water and relax on a wave of island magic. After cleansing, make sure you are always using a hydrating serum followed by a hydrating moisturizer. A serum adds that extra boost to your skincare routine and will help keep your skin flawless under your makeup. The combination of serum and moisturizer will also help keep your skin fresh, youthful and healthy. Coconut oil isn’t just a pantry staple, it should hold an important place in your skincare routine too. It’s also one of the best ingredients to combat dry skin in the winter. 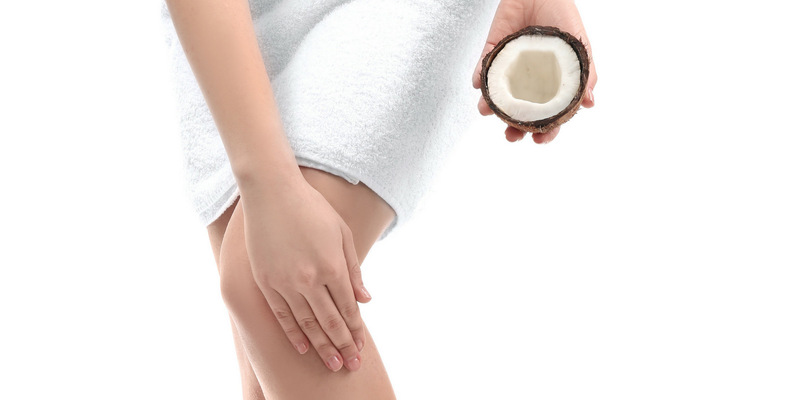 Coconut oil is high in both Vitamin E and fatty acids like lauric acid, myristic acid and capric acid (among many others) which makes it anti-fungal, anti-oxidizing and anti-bacterial. To get the most out of your coconut oil, try this easy DIY coconut oil face mask. Stir in the coconut oil to make a smooth paste. Apply to your face and leave it on for 20 minutes. Why This Works: Along with the coconut oil, banana can help provide instant relief from dry, itchy skin due to its moisturizing properties. The high levels of fats in coconut oil also leave your skin soft and smooth, making this mask a perfect choice for your dry winter skin. Slow and steady may be the moto for most things but when it comes to your natural skincare products, it couldn’t be farther from the truth. Instead of taking your time to apply your products and waiting in between, follow each product immediately with the next in your routine. For example after you use your cleanser, apply your toner, and then follow it immediately with your serum while your skin is still slightly damp. A faster routine means your skin stays hydrated during the whole process, which is important for dry winter skin. The problem: A nice hot shower on a cold, rainy or snowy day is something we all dream of in wintertime but while it might seem like a great idea it could be wreaking havoc on your skin. Hot showers and baths only work to strip the moisture from your skin, a definite problem for your already dry winter skin. Close your bathroom door when you shower or bathe to trap humidity. This will help your cream pull moisture back into your skin. Keep your bath and shower 5 to 10 min max using lukewarm, not hot water. Switch to a less aggressive, moisture-rich cleanser made for sensitive skin, such as Pure Fiji’s Coconut Milk Shower Gel. Gently pat yourself dry to avoid overdrying the skin. Apply Pure Fiji’s Body Butter immediately while your skin is still slightly damp. Did you know… you have a three-minute window for best results? Wait any longer and the moisture starts to disappear from your skin before you can lock it in. The problem: With the arrival of winter inevitably comes the arrival of holiday season and you know what that means – stress! The holidays tend to trigger emotional stress, whether from family, gift giving or the pressures of getting everything done perfectly. And with this stress comes skin problems like acne, psoriasis and eczema. The solution: Instead of focusing on the stress of the holiday season, try using exercise, meditation or yoga as an outlet for your stress. If working out isn’t your thing, try doing a hobby that you love like reading, sewing or baking to help relieve your holiday stresses. If dry winter skin is your problem, make sure you avoid any harsh peels, masks, alcohol-based toners or astringents as they will just strip the natural oils of your skin – making your dry skin even worse. Instead, we recommend using Pure Fiji’s Balancing Toner – a non-alchohol toner with passionflower and witch hazel extracts to restore balance. It’s also enriched with green coconut water to remineralize, nourish and energize cellular exchange, leaving skin refreshed and revitalized. The problem: Especially with the holiday season coming up, you might have become more lenient with your food choices – maybe choosing things that are high in salt, preservatives or fats? If that’s the case, you might start to notice that your skin is more puffy and dry. The solution: Try to eat a variety of foods, focusing on ones that are rich in Omega-3 fatty acids, silica and anti-oxidants. The following list of foods will not only help nourish your skin, but also help keep it healthy and moisturized. Sweet potatoes are rich in beta-carotene and contain an abundance of vitamin A – one of the most important nutrients needed to combat and prevent dry skin. The anti-oxidants in sweet potatoes also help to repair tissue damage and prevent signs of premature ageing. Oysters are chock full of zinc, which helps combat dry skin by creating collagen. If oysters aren’t your favorite, try eating other foods rich in zinc like beef, beans and wheat germ. Cucumbers are made up mostly of water and contain high amounts of silica – an important nutrient needed to increase moisture in the skin. Cucumbers also contain vitamins A and C which help to soothe dry skin and fight any further damage. The problem: When you think sunscreen, your thoughts probably immediately turn to summer, not winter. As such you’ve probably put your sunscreen away along with your bathing suit and beach towel. However, even in the winter, UV rays can interfere with the skin’s barrier function, causing a reduction in ceramide levels and preventing skin from holding on to any moisture. The solution: Always use a moisturizer or foundation with an SPF of 30 or higher every morning. Make sure you carry a sunscreen powder with you in your purse for any touch-ups needed throughout the day, especially if you spend any time outdoors. Keeping your winter skin soft and smooth doesn’t have to be difficult. With just a few simple changes to your winter skincare routine, you can have great skin on your face and body all year long. And remember, no winter skincare routine is complete without excellent natural skincare products like those from Pure Fiji. With their extensive line of all natural products, you’re sure to find your new favorite winter skincare remedy!